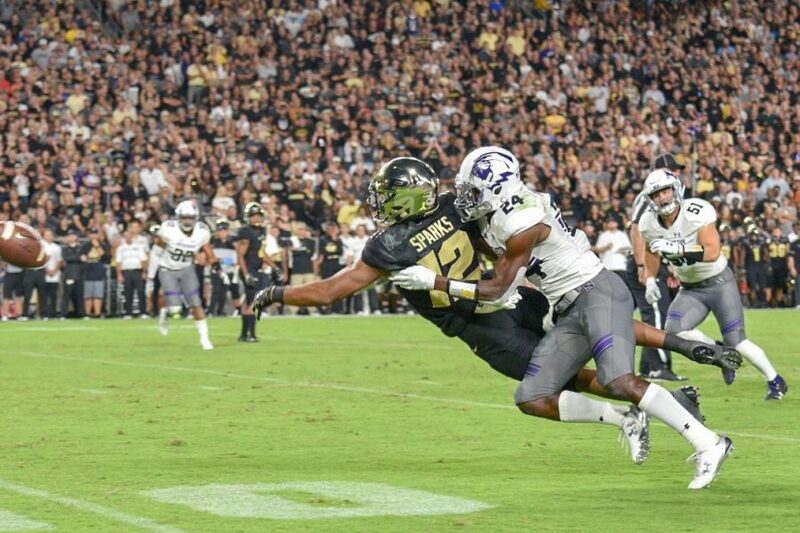 Northwestern cornerback Montre Hartage forces an incomplete pass intended for Purdue receiver Jared Sparks on Thursday night. WEST LAFAYETTE, Ind. — Purdue quarterback Elijah Sindelar had 18 completions and 196 passing yards at halftime. Freshman phenom Rondale Moore had 98 receiving yards and another 79 on the ground, with a touchdown in each variety. And Northwestern led 31-17. Then in the second half, the Wildcats stepped up as the offense failed to score for the entire post-halftime period, keeping the hosts to just 10 points as NU eked out a 31-27 win in Thursday night’s season opener. Together, it marked two different defensive performances for the Cats, each successful in their own right. The defense made its first impact on the game’s opening drive, when sophomore safety J.R. Pace intercepted Sindelar in NU territory, setting up the first touchdown drive of the season. But the impact was felt more significantly about a quarter later, when Hall — just returning from a torn ACL last December — leapt to his right to snag a Sindelar pass out of the air. That led to a three-play touchdown drive over just 55 yards, extending the Cats’ lead to 10. And two Purdue drives later, a strong pass rush forced Sindelar into a woeful pass that fell easily into the arms of senior cornerback Montre Hartage. Five Jeremy Larkin rushes later, the Wildcats had a two-touchdown lead to take into their Ross-Ade Stadium locker room, despite Moore’s eye-popping numbers — and thanks to points off takeaways. Those were all the turnovers NU would get. But the Cats stepped up in other ways. The visitors slowed Moore’s production; replacement quarterback David Blough led just one touchdown drive, and another stalled in the red zone as the Boilermakers notched just 148 yards after the break — compared to 324 in the first half. The pass rush also strengthened in the second half, including on the biggest defensive play of the game, when senior defensive tackle Jordan Thompson notched only his third career sack to force a punt on Purdue’s final offensive play of the game. It was an impressive debut for a unit playing with two new starters at safety, more unfamiliar faces — including true freshman Greg Newsome — at cornerback, and additional first-time starters at linebacker and defensive tackle. And when the offense struggled, the defense didn’t.